Try to schedule the molding machines so that they will be running the same resin types: i.e.- leave a press to run clear and white resins or one that runs all of the nylon jobs. That will reduce the amount of purging required to get rid of the ABS when switching to PC and so on. Run a press empty before starting a changeover. Make sure everyone is prepared for the change over before it happens. If you must do a color change between molds, run a bit of natural through the last mold, providing it has a hot runner. Cold runners will be more about cleaning the hopper, barrel and screw out. Make sure the material handlers know how to properly clean a resin line or hose/hoppers. Use Nerf balls with WD-40 on them is one of the best ideas I've used over the years. I worked in a custom shop that used "bank the heats" on a large clear lens (PC with UV+FR). We banked the barrel heats when shutting down for the weekend, and Sunday startups were a breeze. Regarding banking the heats, the issue of how to stop and start a machine changes from material to material. It is important not to cool a molding machine with PC in the barrel. So, banking works better there than in some other materials. Keep a press that runs just clear jobs is a good idea. 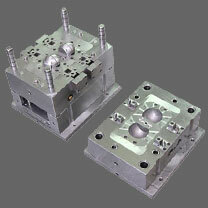 Keeping the molding machines on similar or at least compatible materials is a good idea. A shop with a wide selection of materials may need to have different procedures for different materials. Running 100% regrind especially un-dried would be undesirable for production purposes. Also I wouldn't recommend using 100% regrind for hot runners when you using 100% virgin material when part strength is essential for the customer. But is a good idea for cold runners and just for startups to reduce scrap and save on virgin material. And I would only use the regrind once then get rid of it. Using regrind too many times would deviate your capable process too much going from regrind to virgin material. Creating scrap that you were trying to avoid.